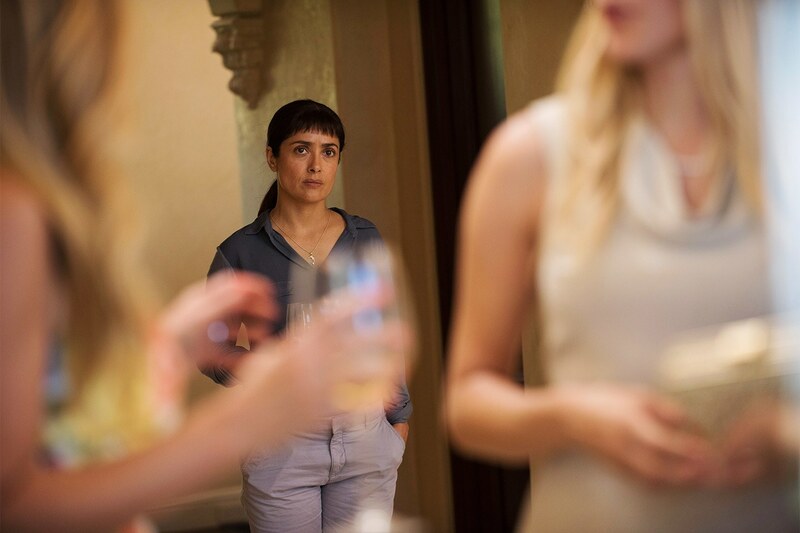 Some reviews of Beatriz at Dinner proclaim the film as an exercise in sitting in discomfort (click here to see the trailer). A massage therapist/healer (Beatriz, played by Salma Hayek) is invited to a small dinner. Everyone except Beatriz is over-the-top wealthy and white. This sets the scene for class, gender, and especially racial conflicts; a cerebral, philosophical play regarding ethical human failings. Writer Mike White and Puerto Rican Director Miguel Arteta (who have collaborated before, most notably with the black comedy drama _Chuck and Buck_ in 2000) create a pastiche of our present historical moment. 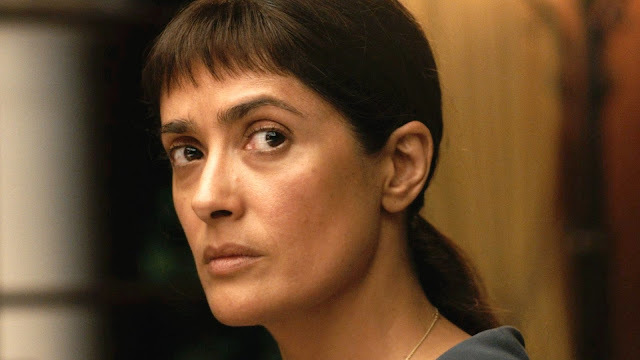 Salma Hayek plays Beatriz quietly, intelligently, and with a fierce passion. She sees all the dinner guests clearly while they overlook, belittle, and make generalized assumptions about her. Sound familiar? The other characters are not flat, however, allowing the viewer to also see more deeply into the psyche of, for example, the real estate mogul (John Lithgow) who could care less about the environment, about people. We have here a working class character who is not silently behind the scenes serving food-- who is not silent at all. Some viewers may ask why couldn't Beatriz be a first generation college graduate lawyer whose made good and joins this dinner to "even" up the match? At this historical moment, to have "this" Beatriz present on film is necessary, especially in the area of healing and nutrition. In one heated exchange, Beatriz tells him: "You think killing is hard? Try healing. You can break something in two seconds. I can take forever to fix it." Lines like these are conversational points of discussion after leaving the theater. This film is also one that is worth bringing into the classroom for discussion. But first, it may be important to set agreed-upon-boundaries on "how" to discuss. And this is again where we are now. People either want to stay away from uncomfortable situations like this or they engage but without knowing how to constructively engage. In the classroom, I have learned to always begin with teaching "logical fallacies" before any discussion takes place. In that way, we do away with flimsy, baseless arguments. We move toward a more meaningful, nuanced way to speak to each other. We also learn when to engage and when to simply observe. Learning to empathically observe (when you know if you even attempt to say anything in that moment, the other person is not going to hear you) can be an interesting exercise in detached, attentive meditation. I mentioned earlier that it is necessary (and prescient!) to have Beatriz as a healer. So many of us are challenged with chronic disease right now. The lines "You can break something in two seconds. I can take forever to fix it," interested me because of my research and writing on diabetes. Diabetes is an outcome of historical and ongoing colonization of our food preparation and practice. It is a breaking of the pancreas, of the metabolic system in our bodies. Diabetes has taken more than two seconds to become what is now an epidemic. It will certainly take a lifetime to manage (fix) due to a society that refuses to offer proper medical care and education for all of its citizens, due to a society that places profit above establishing a nutritious food culture for all, due to a society that allows pharmaceutical companies to place profit above all else. I've come to see healing as, indeed, a lifetime commitment. We are healing from past and present "breaks." How to recognize what we must heal within and outside of ourselves is key. 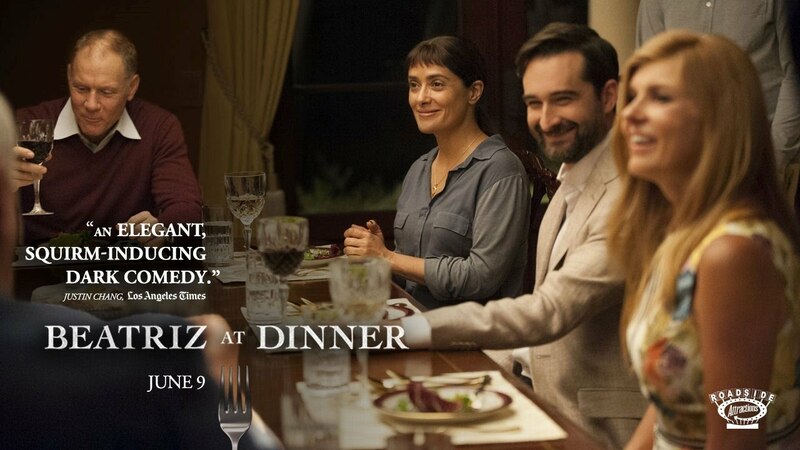 Beatriz at Dinner opened this weekend, June 9th, in select theaters, It opens June 16th nationwide. Go see it!